There are really three films here: a wildlife adventure; a Cold War thriller; and a standard issue Hello, hello, what's all this then? cop yarn complete with Jack Warner. The story concerns a boffin's wife who absconds to Lapland with her husband's invention and his assistant, played by Anthony Dawson. 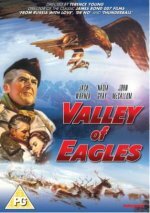 The husband and a policeman set off in pursuit and, after being attacked by bears en route, meet the Laplanders who hunt with eagles. Directed by Terence Young, who later made Dr No with Dawson as its sub-villain, this is ambitious for what is really a B-movie.